At an age when most tennis pros begin to consider retirement, Andre Agassi didn't let a career slump keep him from becoming one of the world's top players again. Today, at 31, he's in better shape than ever. "I am moving better. I am fitter and I am bringing experience, so that allows for a pretty airtight package," Agassi said. Agassi's No. 1 ranking by the Association of Tennis Professionals (ATP) is in sharp contrast to four years ago, when he had sunk into the worst losing streak of his career. Then married to actress Brooke Shields, he was earning millions of dollars in endorsements, but ironically his tennis game was off. He had dropped to his lowest ranking ever at 141, according to the ATP. "It's like I had to either play or stop," Agassi said. Andre Kirk Agassi was born April 29, 1970, in Las Vegas, Nevada, to Mike and Elizabeth Agassi. His father was a native of Iran and his mother American. Mike Agassi was a Golden Gloves champ who boxed for Iran in the 1948 and 1952 Olympics. Settling in Las Vegas, he became a tennis pro at the Tropicana. His passion for sports, especially tennis, was evident as he built a mini-training camp in his back yard for his three eldest children, Rita, Philip and Tami. Equipment included a full-size court, which Mike Agassi himself laid, and a tennis-serving machine rigged to fire balls faster than the usual speed. But it was the youngest Agassi, Andre, who was a tennis prodigy. At age 2, the future pro was running around with a racket taped to his hand and sleeping with a tennis ball over his bed. "(My dad) was convinced if my eyes are going to move around as a little baby, I might as well be looking at a tennis ball," Andre Agassi said. "He practiced every afternoon, all afternoon. He practiced every weekend, all weekend. He practiced every holiday that I can recall," said family friend and manager Perry Rogers. "It was just what they did." By 10, young Agassi was winning against some of the same players he would face later in Grand Slam tournaments -- Pete Sampras, Jim Courier and Michael Chang. Three years later, Mike Agassi needed help training his young prodigy. He turned to Nick Bollettieri, a famed coach who had started a tennis boarding school for youths in Bradenton, Florida. "Mr. Agassi was very domineering. ... Tennis. Tennis. Tennis. Tennis," Bollettieri said. "He had the ball machines out in the back. They had the ball machines in every room." Andre Agassi turned professional at 16 and, with Bollettieri's help, rose to No. 3 in the world two years later. The young champ had a bad boy reputation, plenty of endorsements, but no Grand Slams. "That was tough for Andre," Bollettieri said. "The billboards, the money and everything else that went along with it. You have to win, too." 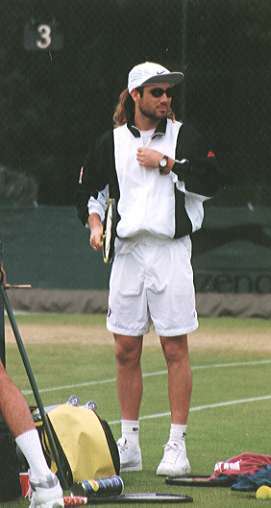 In 1992, Agassi decided at the last minute to go to Wimbledon. He advanced to the finals against the odds. "I didn't need that pressure to feel the pressure because I was already putting it on myself," Agassi said. "I wanted to win. I wanted to not just make it to the finals. I wanted to see what it felt like to win." Then, in the last match against Goran Ivanisevic, who had already broken several records in the same tournament, Agassi prevailed. The victory was unexpected, but Agassi felt a weight had been lifted, he said. Soon after Wimbledon, his relationship with Bollettieri, who had been something of a father figure, began to unravel. Bollettieri said he felt Agassi was starting to squeeze him out of coaching. After 10 years together, Bollettieri resigned. "We've had our ups and downs, but he helped my career a lot, and there just came a time when it needed to be different," Agassi said. "For what reasons, I am not sure. I don't even completely understand even today." Bollettieri said he regrets the way he handled the split. "I made one of the gravest misjudgments ... when I wrote that (resignation) letter," Bollettieri said. "You look back and say, 'How could I have done that?'" 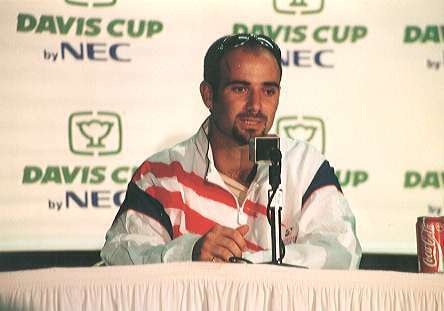 Agassi then turned to fellow player Brad Gilbert to coach him. Soon after, he clinched the U.S. Open in 1994, the Australian Open in 1995 and the Olympic gold medal in 1996. Life off the court began to accelerate when he met Shields in 1993. Mutual friend Lyndie Benson, wife of saxophone player Kenny G, suggested the two should meet. Agassi and Shields talked on the phone and faxed each other messages for six weeks before they met. "They could completely relate to each other. They were both working on getting their careers where they wanted," Rogers said. Their experience as child stars also drew them closer, he added. After a nearly four-year courtship, the two married April 19, 1997, in Carmel, California. 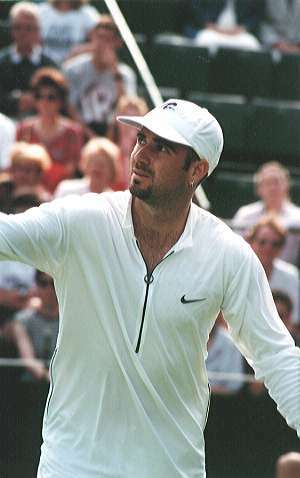 Shields' career seemed to be on the upswing with the NBC sitcom "Suddenly Susan," but Agassi began to lose one match after another. "It's probably clear to me before it's clear to anybody because I know what I am feeling even before I go out there and lose that match," Agassi said. "I was just losing every time I played. And I couldn't beat anybody anymore." In November 1997, Agassi sank to the lowest point of his career, ranked at No. 141. The struggle with his game began to put a strain on his marriage. Ten days short of his second wedding anniversary, Agassi filed for divorce. At age 27, when many players think about quitting, Agassi was determined to win again. Gilbert, Agassi's coach and friend, talked with him about the possibilities of a comeback. "If you want to re-dedicate yourself," Gilbert told Agassi, "I'm there with you. But if you don't want to re-dedicate yourself, we're not doing each other any good." Soon after, Agassi began a strenuous training routine and healthy diet. "It's a combination of a lot of weight training, a lot of cardio, sprinting, working on hills, combined with the tennis court," Agassi said. Gilbert described the training. "He's running so hard. His body is aching so much. His legs are on fire. His lungs screaming as he is sprinting up the hill, and on his face, you see the look of pain, but you also see the look of purpose," he said. In 1999, Agassi won the only Grand Slam title he had not yet claimed, the French Open. He became the first man since Rod Laver in the 1960s to win all four Grand Slam events. But tragedy struck just as Agassi began to climb back into the spotlight of the tennis world. He learned that his mother and sister Tami both had been diagnosed with breast cancer. "It was a pretty difficult time," Agassi said. "It was also pretty eye-opening in many ways, personally." Two days after he publicly revealed the news, Agassi lost in the second round of the U.S. Open. He then decided to spend time with his family in Las Vegas and took off two months from tennis. "There was nothing more important than his mom's health and his sister's health," Rogers said. Agassi said his sister Tami and his mother are now feeling better. The tennis star isn't only focused on his family or his game. He enjoys the company of Steffi Graf, the only other tennis player who has won all four Grand Slams and an Olympic gold medal. "She's an amazing woman," Agassi said of Graf. They have been together since Graf retired in 1999 with an amazing 22 Grand Slam titles. The couple is expecting their first child in mid-December, 2001. Off the court, Agassi spends time giving back to his hometown. His foundations gave nearly $1.5 million last year to help at-risk kids in Las Vegas, including Child Haven, a children's shelter; construction of a new charter school; and the Agassi Boys and Girls Club. "I have never met anyone who is more honest and more forthright," Gilbert said. "He's got the kindest heart that I have ever met." But now that the former bad boy of tennis has matured, how many more years can he continue to dominate the game? "I don't know how long I can do it for, or how long I choose to do it for, but I want to do this for a number of years," Agassi said. Rain canceled play at the French Open in Paris on Tuesday, thus delaying Andre Agassi's first appearance as defending men's singles champion. CNNSI.com's Pedro Pinto caught up with Agassi during a practice session this week at Roland Garros. PARIS -- Paris, the City of Lights. Will they shine on Andre Agassi once again? "There are expectations on fans part and maybe even on my end," says last year's champion. "I certainly expect a lot from myself, but overall it's now a feeling of just honor and privilege to be defending champion." His title at Roland Garros last year made him only the fifth man in history to win all four Grand Slams. For the first time in his career, Agassi went on to finish the year at No. 1. "I don't know what kind of edge I had," Agassi said. "I was pretty thankful of tournaments I had won prior, but something about winning here and completing them was a dream come true and it's changed my career. It's changed my life. I'll never forget it." That victory has turned him into even more of the center of attention. "I think like last year he has a chance to go through this year," said Brazilian Gustavo Kuerten who won the title in 1997. "[It] depends a lot on first rounds. He has to build his game like everybody has to do it." One person who can appreciate Agassi's success on clay is fellow American Pete Sampras who has had little success as evidenced by his first round defeat to on Monday to Mark Philippoussis of Australia. "Even though he hasn't played much on clay we know he has the game to play very well on dirt," Sampras said. "Winning here last year was a great effort. The game is very strong, so many clay court players. I look at any of 30 guys that could win it here." And with many grueling five-set marathons expected on this slower surface, it might all come down to who is in shape, and who is not. "Fitness is so huge here," says Agassi. "I'm making sure I'm prepared for each match and breaking down my opponent and be willing to pay the price." A price which has already brought him the Australian Open title this year. And now more than ever, Agassi feels content with his place in the game. "You're always making sure you're where you want to be and for me, I'm pretty clear about where I am at the moment. How long that lasts or the direction I go, I can't make any promises there." Agassi will try to make the finals of the Grand Slam tournament for the fifth time in a row. He has won three out of his last four major title matches with his only loss coming to Sampras last year at Wimbledon. thats what i consider the icing on the cake"
Even while distinguishing himself as a globe-hopping tennis star, Andre Agassi never strayed from his Las Vegas roots. His love of the city goes beyond the glittering Strip to the gritty, less visible neighborhoods. Since 1994, the 30-year-old son of a casino host has helped disadvantaged kids in his hometown find ways to grow in sports, the arts and education. His Andre Agassi Charitable Foundation funds projects for children in low-income, troubled areas. "I'm very motivated to help them because they represent such honest innocence," says Agassi, the winner of six Grand Slam tournaments and the 1996 Olympic gold medal. "It's an impressionable time in life when you're young. Direction and opportunity and hope are key parts of the future." Even by age 20, Agassi wanted to put his wealth and celebrity to good use. He formalized his charitable plans three years later with longtime friend Perry Rogers, who is also his attorney and the foundation's president. "Andre started talking about the fact he wanted to do something more in his life than play tennis," Roger recalls. "He said, "I want to give kids an opportunity to make better decisions for themselves." The foundation began by giving $1.25 million for construction of a new Boys & Girls Club, which opened in 1997. Agassi's vision-fulfilling complex serves 2,000 kids ages five to 17 with tennis courts for Team Agassi (a competitive traveling complete with professional coach), a full-size gym, computer labs, guidance counseling and other activities. This is just one facility that illustrates Agassi's powers of persuasion. He convinces businesses and celebrity friends to give time and money to his Grand Slam for Children, an event that began in 1995 and features a dinner, auction and concert. Elton John is a regular, and other guests have included Robin Williams and Dennis Miller. Last year the gala raised $3.9 million. After a one-year hiatus, it will return in 2001. With a $12 million endowment, Agassi's charity funds a range of projects. They include eight fine arts scholarships at the University of Nevada at Las Vegas, a charter school that will open in 2001 and a special-needs medical cottage opening in the spring at the Child Haven protective custody center. "We're usually the ones people call when they're looking for funding or looking for help," says director of development Julie Rossetti. "If we can't help, we put people into the hands of someone who can." Agassi quietly enjoys the fruits of his munificence. When he's home, he tries to work with the tennis team or visit Child Haven's education center, often in unplanned, unadorned appearances. "The children and the smiles on their faces, that's what I consider the icing on the cake," Agassi says. "You get to really reap the benefits of the difference you're making."